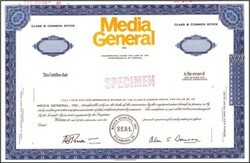 Beautifully engraved SPECIMEN certificate from the Media General Inc. This historic document was printed by the American Banknote Company and has an ornate border around it with a vignette of the company logo. This item has the printed signatures of the Company’s President ( Alan S. Donnahoe ). 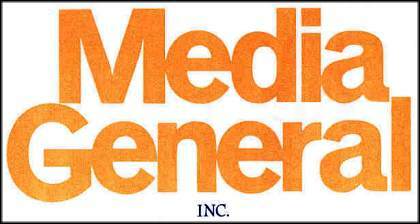 Media General is an independent, publicly owned communications company situated primarily in the Southeast with interests in newspapers, television stations, interactive media and diversified information services.